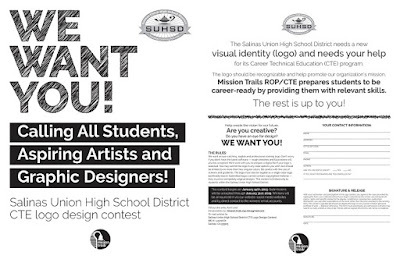 Salinas, CA, January 21, 2019 — The Salinas Union High School District needs a new visual identity (logo) and needs your help for its Career Technical Education (CTE) program. The logo should be recognizable and help promote our organization’s mission, Mission Trails ROP/CTE prepares students to be career-ready by providing them with relevant skills. * Help create the vision for our future. * Do you have an eye for design? We want an eye-catching, legible and professional-looking logo. Don’t worry if you don’t have the latest software — rough sketches and illustrations will also be accepted. We’ll work with you to prepare a digital file if your logo is selected. You may submit the logo in any color options you wish but should be limited to no more than two singular colors. Be careful with the use of screens and gradients. The logo must also be legible as a single-color logo (preferably black). Submitted logos cannot contain copyrighted material —they must be completely original designs. This contest is limited only to students within the Salinas Union High School District. 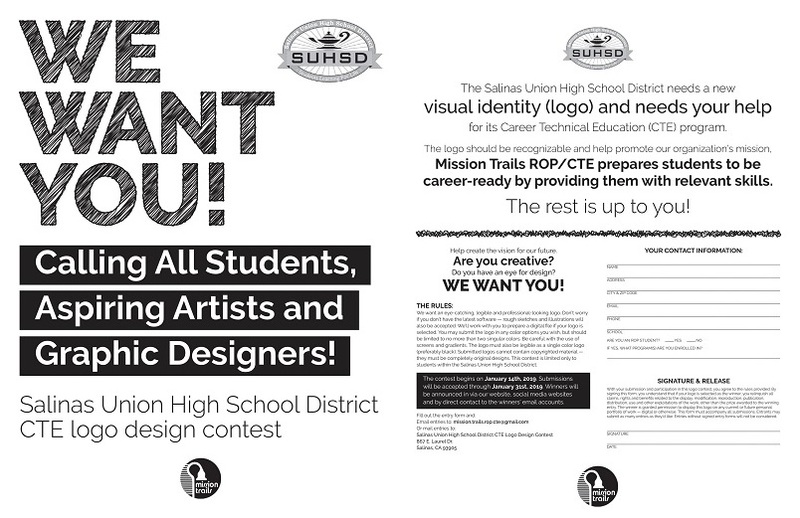 Or mail entries to: Salinas Unified School District Mission Trails CTE Logo Design Contest 867 E. Laurel Dr. The winning artist will win bragging rights to all of their friends, family and fellow students as well as a $100 gift certificate to dinner at Portobello’s in Salinas and an Amazon Kindle e-reader. For more information, call (831) 753-4209.